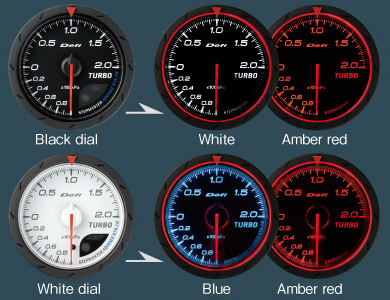 The installation of additional gauges is easy. Just connect the new gauge to existing gauges and attach the wire to the Advanced Control Unit. The micro controller calibrates up to 270 degree angle in 3027 - 4600 segments (0.088°- 0.059°), and provides accurate vehicle information. A mounting bracket, meter cup, regular position bezel, cables and sensors are provided with this product. Defi-Link ADVANCE SYSTEM products are not compatible with Defi-Link SYSTEM products.